If you’ve ever wondered what 100 thousand ecstasy pills looks like… Well, you’re looking at it. 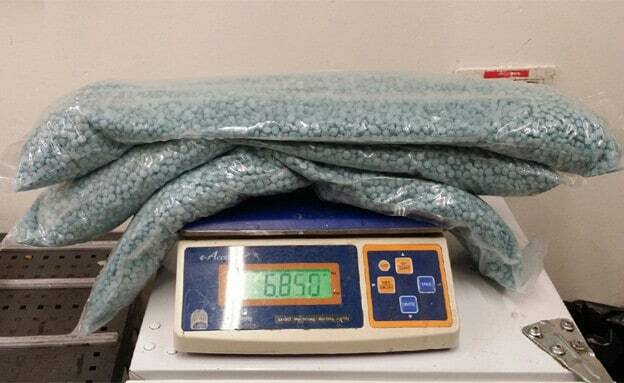 Yesterday, a mother and her son from Netherlands were caught in Israel’s Ben Gurion Airport with 100 thousand ecstasy pills in their suitcase. The drugs weighing 7.5 kilograms and worth $430,000 were found in the “double wall” of their suitcase upon arriving in Israel. According to JOL, the 57-year-old mother and her 19-year-old son claimed to be on their way to a family event in Jerusalem, but the suspects were questioned under suspicion of importing and dealing drugs and admitted to the charges during the investigation. The two were arrested and the court decided to extend their arrest until Tuesday.